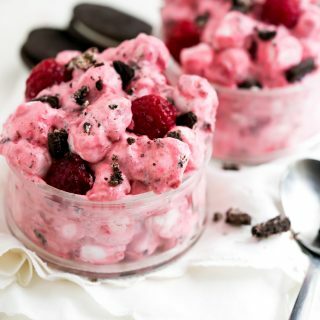 Is this Raspberry Oreo Fluff a salad? Is it a dessert? Let’s just keep our bases covered and call it both. Because in a perfect world salads and desserts should be synonymous don’t you think? 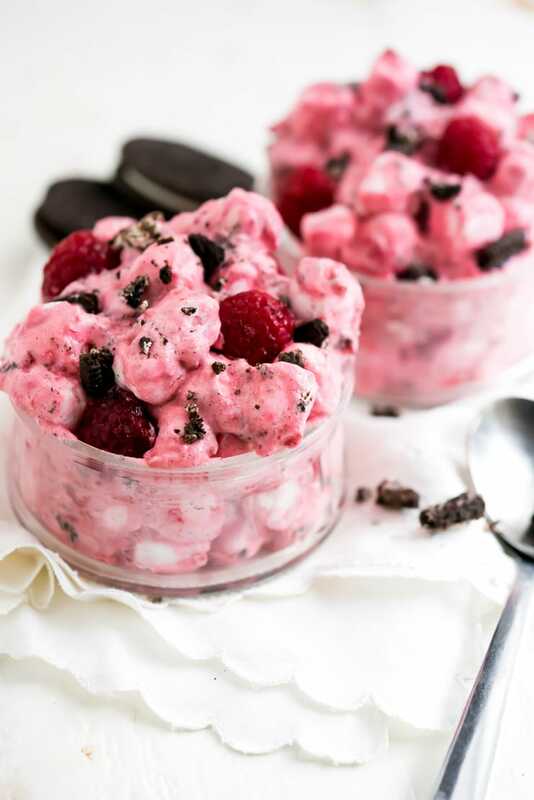 Are you ready for this Raspberry Oreo Fluff? I’ve always loved my recipe for Cranberry Fluff Salad and it’s become a holiday staple in our house. Well, that is until this last round of holidays when we bought the ingredients for it not once, but twice with hopes to make it for Thanksgiving and then again on Christmas. Both times we over estimated our ability to cook every.single.thing.we.want. and had to pass it by. It wasn’t until I was going through my pantry last week when I realized I still had two big bags of marshmallows waiting for their inclusion in Cranberry fluff and realized I needed to help these marshmallows meet their fate. Except, it turns out that fresh cranberries are ridiculously hard to find in late January. Who knew? So, I decided raspberries needed to take center stage in place of the cranberries and that Oreos needed to find their way into the recipe too. Because, you know, Oreos. 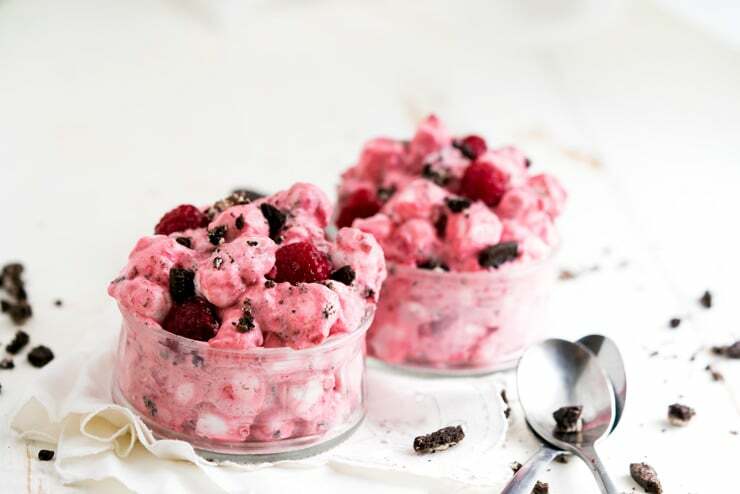 Once I had this Raspberry Oreo Fluff all put together I realized what a pretty little fun treat this makes for Valentines Day! It’s fruity, slightly tart, definitely fluffy and has hints of chocolate throughout. Is it a salad? Is it a dessert? 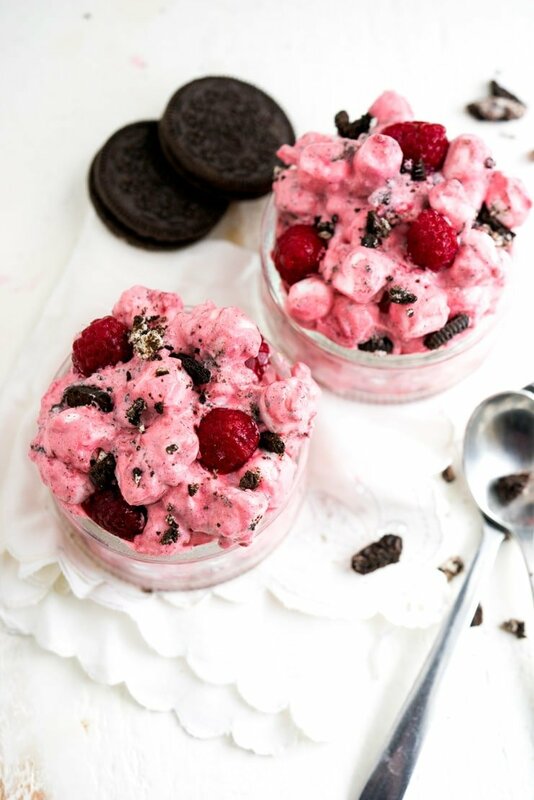 Let's just keep our bases covered and call this Raspberry Oreo Fluff both. Because in a perfect world salads and desserts should be synonymous don't you think? Stir frozen, thawed raspberries with sugar until most of the shape of the raspberries dissappear. If needed you can microwave them slightly to soften. If raspberries are warm, place in fridge until chilled. Stir ½ of the Cool whip into the raspberries until well combined and then gently fold the remaining cool whip into the raspberries. Fold marshmallows, fresh raspberries, and Oreos into the raspberry mixture and mix until just combined. Cover and refrigerate for at least 1 hour before serving to allow the marshmallows and Oreos to soften a bit.